Medium Project 7-2, Kitchen Remodel » Roger Perron Inc. Contemporary kitchen remodel design performed, which created a unique look that was what the owner had really wanted for years. We custom built the cabinets with a laminate finish in white. The counters are blue granite. The tile flooring we installed and extended into other rooms. See photo #3 before construction. 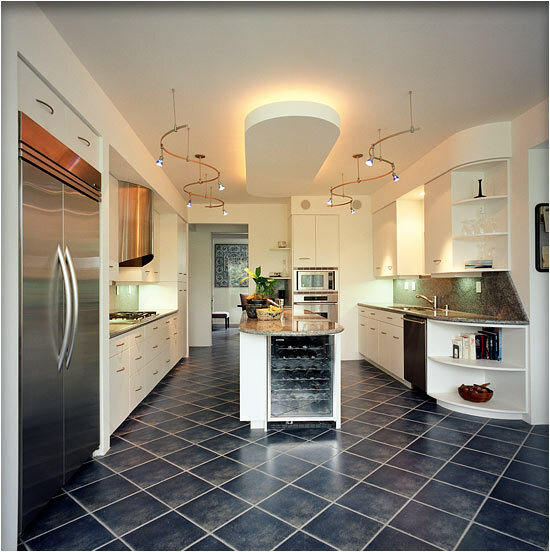 Kitchen remodel in Bel Air home designed by Roger Perron, design-build contractor.